In the automobile segment, there is a huge need for proper education, which dealers never provide. By education, we mean the knowledge on proper maintenance and operational habits, care of the machine and so on, this is because of the fact that they are more oriented towards achieving a particular sales target and in the process forget about providing the new owner with useful information. Its actually rare to find someone who has been educated at the time of purchase about various aspects of the vehicle he is purchasing. There was a time when 2 stroke engines ruled the roads and if you had a plan to buy a machine back then, the dealer would have said a lot about the machine even before you actually bought it, But they frequently missed out on informing the new buyer, after he has purchased the vehicle, about the grade of oil to be used in the engine. This reportedly caused a number or engine seizures as the owner simply did not have knowledge and caution on the type of oil to use. All vehicles, be it big or small, need great care for extended service life and reliability, you would know that not everyone around is directly or indirectly related to the automobile arena so hence a lot of them would just simply follow the principle of ‘fill it, shut it, forget it’. Each machine has a lot of moving parts and the reality is that most of them depend on each other for proper functioning, if one of them were to fail, then the resulting event would be like a chain reaction which would lead to failures of different kinds. There are spares which can and cannot be serviced and maintained by the average person, some of the spares which can be maintained also happen to be crucial components, they, can also be taken care of quite easily simply with a little spare time and a few basic tools at most. So how can I maintain the bike myself, you might wonder? Well, here is a list of things which can you can take care of. Adjustment of Hinges (if any). This is a really important part of the bike, and as you might know, the bike won’t move at all if it’s in bad condition. During the monsoons, bike that have an open chain and sprocket against a covered one would need regular oiling, but at the same time, oiling for a closed chain and sprocket can be done just once in two weeks or something. The conventional way for lubricating chains was by using molten grease. This procedure was quite lengthy and used to take almost 12 hours to complete the job. But now you get special sprays for lubricating the chain system. Along with the sprays, engineers would also advice on greasing the chain. But an open chain system requires either grease or spray due to the fact that grease or oil is a real magnet for dust and dirt; you might realize this when you look at a well greased chain after a week or so of riding. The usual interval for greasing the chain varies depending on the weather and the riding conditions. It’s usually recommended to grease it once in one or two weeks. 1st method: Remove the chain from the machine; Dip it in clean diesel for at least 5-6 hrs. Then use the brush (plastic type bristles) for cleaning the mud out of it, and then re-wash it in clean diesel. If possible, hand it for about 2-3 hours to allow the diesel to drip out of the chain. This process would make the joints and the links on the chain free and smooth, the next step would be to dip the chain in EP90 oil or in 20W40 engine oil. There is no need to buy expensive or branded oils for it. You can buy oil which could be affordable, because the ultimate aim is to clean and lubricate the chain links in order to keep it from rusting, coming back to where we left off, after dipping it in the oil keep it that way for 4-5 hrs. And then allow it to hand in order for the oil to drip away, after you have done all of the above, simply install the chain back onto the machine. 2nd method: This is a more common method used for chain cleaning. Follow the same steps as above until the part where you allow the diesel to drip off from the chain, after that, take about half a kilogram of AP3 grease and heat it up so that it turns into a molten liquid. After its liquid enough, pour the same onto the chain and wait till the grease turns solid. After making sure that the grease is cold, remove the chain from the drive system and remove all the extra grease by wiping with the help of a soft cloth. This would make the chain ready to use again and so you can install it back on to the machine. This happens to be an essential spare in a two wheeler. On our Indian roads, the horn and warning lights are an important element, these systems require the battery for functioning. A battery is made up of lead, which is dipped in acid water. Acid water also means electrolyte, this means that the battery acid can actually damage the paint job and cause corrosion to other parts as well, so when you handle a battery, make sure you do so with care. Also, one common problem that batteries face is the oxidation or terminals. Each battery has a positive(+) and negative (-) terminal and overtime, the reactions in the battery cause these terminals to oxidize and that in turn reduces the voltage it can deliver. So, how this can be avoided? Well in the market there are special sprays available for battery terminals. ‘Battery Coat’ is the best spray in my opinion and this can be sprayed on the terminals to remove or avoid oxidation. The spray avoids the terminals from direct contact to the air. If the spray is not readily, available then the best and the most conventional way to solve this problem is by using VASELINE petroleum jelly. By applying some amount of petroleum jelly the oxidation will not take place. The main drawback of this jelly is that it has a low melting point and during summer seasons, you might find that you need to do it a little often. Control levers, brake springs, brake pedals are some of the common points where its advisable to apply grease. Different climates also dictates the use of different types of lubrication. When it rains, it would be unadvisable to use oil for lubrication as it would get washed away easily. Grease would be the best for the monsoon. In summer as we know the temperature is high and its usually always dry. Generally air flows with dust particles. So in summer using oil is the best option for some of the spares. In rains, generally, the temperature becomes very low. At this time greasing would be the best option rather than oiling. Grease attracts dust very fast and could create resistance in moving parts. This process is very simple and can save you a lot more than money. Every vehicle would have its own basic tool kit. Generally all motorcycles, scooters have 13mm nut size for adjusting the rear brakes. A suitable tool for this bolt would be in the tool kit. There needs to be a little caution applied when tightening the brakes as a tight setting can jam the brakes and cause a lot of problems like engine and brake overheating and also low mileage, at the same time a loose brake setting can slow your reaction time down. So adjust it as required. One of my friends used to wash his Bullet for at least 6-7 hours. Well yes 6-7 hours, wondering why? Passion. He used to wash with brush, diesel, cleaning soap etc. Many washing centers simply use a soap mixture and a dirty towel (which can really scratch your paint job). They would just do it for the money. You, on the other hand, know your vehicle well and so it would be easy for you to clean it, here are a few tips that can help you. Oil stains can be removed easily by using solvents like diesel or kerosene. First spray some water on the machine and then use diesel or kerosene. Then spray water for cleaning it. If you own a new machine, you can keep its paint looking like that everytime by following some simple steps. Use a soft, clean towel and try to wash the mud (on the painted parts) out rather than scrape it off. Also, as much as possible, use a Ph neutral shampoo. Look on the label before purchasing it. After washing don’t forget to oil or grease the joints or parts as told above. Avoid greasing or oil before wash as it may become useless. These levers are made up of some kind of alloys. 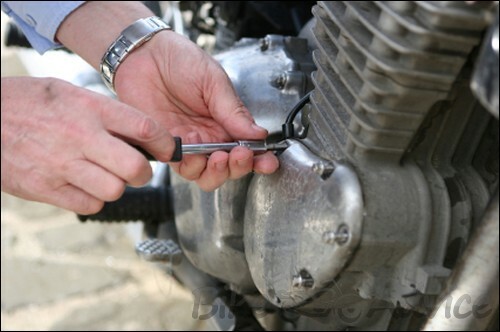 But since it is a moving part that a rider would use frequently, make sure you grease the joints well. These are usually found on Royal Enfield Bullets and Honda scooters. These hinges always require oil and rust cleaner spray to keep rust away and they can break loose if not well maintained. I have explained how you can easily maintain your bike rather than spend money by sending it to the workshop. No dealer would keep reminding the rider to service the bike all the time. These are factors which the riders would need to keep track of in order for the machine to be in service flawlessly for a long time and always remember, respect the machine, the machine respects you.